You are not the only one who cares about your student loan balance. In fact, other lenders will consider how much student debt you have before approving an additional loan. This, combined with the fact loans cost more money the longer they exist, should be reason enough to know your balance and work to make it smaller each month. Most lenders today provide online resources for you to track your loans. If you pay your bills online, then you can access your account information online. Go to the website for your lender. Here, you will need to have your account information handy in order to sign in and access your account. It is likely you will create a username and password at this step so you do not have to have your account information in the future. The first screen most lenders take you to will show you the last payment you made and when the next payment is due. You can navigate to payment history, and there should be an easy to find place to see your remaining loan balance. Contact your lender if you cannot find this information online. If you subscribe to a credit monitoring service, your credit report will also contain the sum remaining on your student debt. You may find the amount remaining on your debt is not only manageable but completely avoidable; you could pay that sum off today and forgo interest in the future. Most borrowers assume it is a good thing to pay off a loan early. However, this is not always the case. The lender will lose expected profits from interest. As such, the lender will charge you a fee to pay the loan off at any point before it matures. Typically, you will be able to access a "pay off quote" on your account. This sum should be larger than the remaining principal but lower than what you would pay if you made payments each month. The one exception is federal student loans which never have a penalty for prepaying. For individuals who have recently graduated, student loan debt is likely the largest debt they hold. However, it is also common to have credit card debt, car loan debt and other personal loans to pay off. The first item to be concerned about is whether you can make your monthly payments without compromising your ability to live. If so, then you are at least living without the fear of default on the loans. The next issue with having a large debt sum is what it will mean for any future loans. If you would like to take out a mortgage, for instance, your mortgage lender will give you much lower limits if you still have a very high student debt balance. 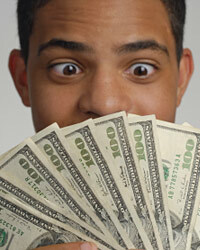 Lenders consider your total income compared to your total debt when making loans. The more you can do to make this ratio favorable, the more likely you are to in return gain favorable loans.